Google Maps allows iPhone and Android Phone users to share their real-time location with friends, family, and colleagues. 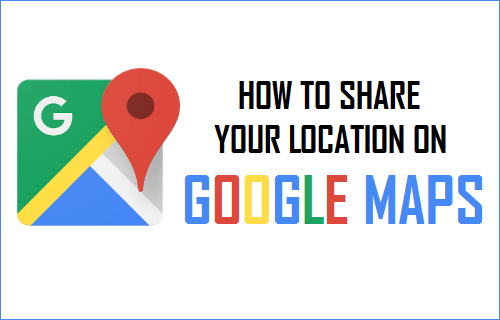 Let us take a look at this feature and learn the actual steps to share your location on Google Maps. Sometimes answering a simple question like “Where Are You” can become difficult, in case you are geographically challenged, not really good at describing locations or you are in a new place and simply do not know where you actually are. You can easily solve this problem; in case you have the Google Maps App on your iPhone or Android Phone. 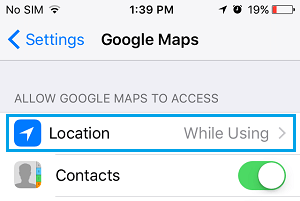 All that you need to do is tap on your current location on Google Maps and then tap on the option to share your location with any of your Contacts. Good thing about this feature is that your Contact will also be able to share his/her real time location with you on Google Maps, allowing both of you to track each other. 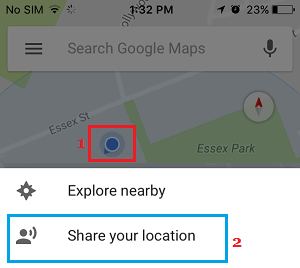 Here are some facts about Location Sharing Feature on Google Maps that you need to know before going ahead with the steps to share your location on Google Maps. 1. The Location sharing feature only works on the Mobile version of Google Maps and not on desktop. However, on your computer, you will be able to see the list of people who are sharing their location with you. 2. Sharing Location with anyone who is connected to your Google Account is Easy and automatic. In case your Contact is not connected to your Google Account, you can still share your Location by sending a Link to your Location. 3. You can configure the duration up to which your location will be shared on Google Maps. The default duration is 1 hour, but you can set any other duration ranging from 15 minutes to 3 days. 4. You can stop sharing your location with anyone at any time. 5. People who you share your location with will be able to see your name, your photo, your current location and they will be getting updates about your location, in case you are driving or walking. 6. The people that you share your location with may also be able see where you have been, whether you are driving or walking and places that you may have marked on Google Maps as Home, Work and other Destinations. You will need to allow Google Maps with access to your Contacts and Location at all the times, in order to use the Location Sharing Feature in Google Maps. 2. 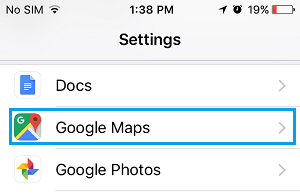 On the Settings Screen, scroll down and tap on Google Maps. 3. On the Google Maps screen, tap on Location. 4. On the next screen, tap on Always (See image below). 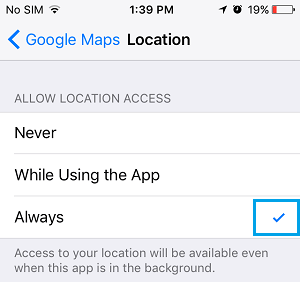 This will allow Google Maps with access to your Location at all the times and even when you are not using the Maps App. The easiest way to share location on Google Maps is to simply tap on the Blue Dot that shows your current location. Tapping on the Blue dot opens a bunch of options, including Sharing Your Location. 2. Tap on the Blue Dot which indicates your Current Location On Google Maps (See image below). 4. On the next pop-under, tap on the + (Plus) and – (Minus) buttons to set the Duration up to which you want to share your location. As you can see in the image below, the default duration is 1 Hour. However, you can set this period to any other time period, ranging from a minimum of 15 Minutes to 3 days. 5. After setting the duration, tap on the Select People option. This will take you to your Contacts screen on iPhone. 7. If the Contact is connected to your Google Account, your location will be automatically shared with your Contact. 8. In case the Contact is not connected with your Google Account, you will be provided with an option to Generate a link to your location on Google Maps and send this link using SMS or any other Messaging app. The person that you share your location with will get a notification. When they click through, they will see your location on the Google Maps on their iPhone or Android Phone. Your Contact too will have the option to share his/her Real Time Location with you on Google Maps, making it easier for both of you to find each other.